Even the best sense of rhythm, the most careful technical training, and the most astute dance intuition aren't enough to make a dancer truly excel; you also need focused strength, balance, and flexibility to execute the movements with power and grace. Conditioning for Dance improves your technique and performance in all dance forms by strengthening the body's core (abdominal and back muscles) while improving coordination, balance, and alignment and optimizing flexibility. The result is more lift without tension, deeper pli "s, higher jumps with less effort, tighter turns, and improved extension and turnout. -optimize your flexibility through touch, movement awareness, and imagery.The book features 102 imagery illustrations paired with dance-specific exercises to help you maximize body-mind conditioning and develop more fluid mobility, balance, and tension release. 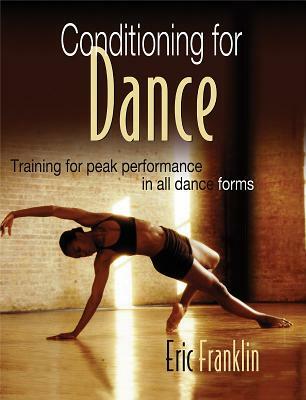 The book culminates with a 20-minute, full-body workout routine designed to help dancers warm up, condition, and refine their dance technique. You'll learn how to execute lifelong dance skills that give power without the risk of injuries. By working the muscles through movements and ranges of motion that approximate the demands of your chosen dance form, you directly enrich your performance capabilities. And as you strengthen the body's core, stretch to gain just the right amount of flexibility, and incorporate the power of the mind, you unleash your full artistic and physical potential. Eric Franklin has more than 20 years' experience as a dancer and choreographer. In addition to earning a BFA from New York University's Tisch School of the Arts and a BS from the University of Zurich, he has studied and trained with some of the top movement imagery specialists around the world and used this training as a professional dancer in New York.Franklin has shared imaging techniques in his teaching since 1986. He is founder and director of the Institute for Movement Imagery Education and is a guest professor at the Universities of Bern, Vienna, Dresden Linz, and Salzburg. Most recently he has taught at the Royal Ballet School in London and at the Royal Academy of Dance in Dublin. Franklin has been on the faculty of the American Dance Festival since 1991 and teaches at universities, dance centers, and dance festivals in the United States and throughout Europe.Franklin is author of Dynamic Alignment Through Imagery and Dance Imagery for Technique and Performance. He also coauthored the bestselling book Breakdance, which received a New York City Public Library Prize in 1984. He is a member of the International Association of Dance Medicine and Science.Franklin lives near Zurich, Switzerland, with his wife, Gabriela, and their two children.